Dr. Stan Lowrance is a well known dentist in the Rockwall community. He graduated Claude High School in 1973, went on to West TX State University and graduated with a Bachelor of Science Degree. He then continued his education at Baylor College of Dentistry earning a Doctor of Dental Surgery Degree in 1981. He opened his dental practice in Rockwall that same year. As a privately owned and operated dentist in Rockwall Texas with over 30 years of experience. Dr, Lowrance and his highly trained staff at Lowrance Dental offer all of your dentistry needs in one convenient place. Lowrance Dental provides general dentistry, family dentistry. cosmetic dentistry. implant dentistry, and sedation dentistry. Serving patients of all ages, Dr. Stan and his team are able to provide compassionate, gentle care that helps patients feel calm and relaxed during their appointments. When you choose Lowrance Dental, you can be sure you're in good hands. most people do not realize the vast difference between dental practices operated by corporations and those run by private individuals. Dr. Stan feels strongly that dentistry is "a service, not a product." People should be treated on an individual basis, with decisions being made that are in their best interest, not made on the basis of profitability. Dr. Stan wants patients to understand that shopping for a dentist is not like buying a car. "You want a personal relationship with your dentist and their staff...a longevity that establishes trust and confidence." Lowrance Dental has a state of the art facility with cutting-edge technology to make sure that each patient is receiving the best experience possible. Many operations can be done in-house which allows added convenience for each patient. While Lowrance Dental offers many different services, the atmosphere still feels like a small family dentist. The staff knows you by a first name basis and treats you like family. 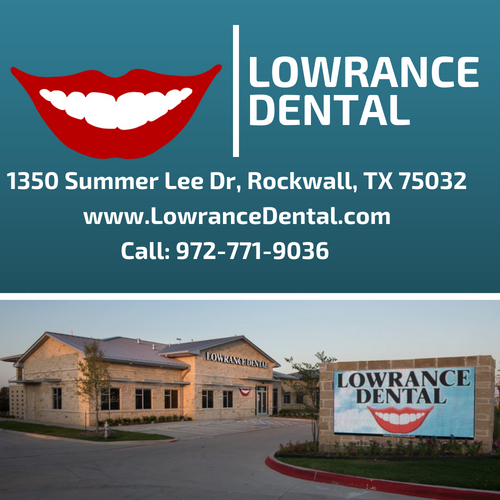 With a comfortable and positive environment, Lowrance Dental takes pride in providing the best dental care in Rockwall, Tx and the surrounding areas. Don't hesitate to give us a call and ask about our new patient special.